When it comes to breakfast foods, this city really knows what it’s doing. Nothing brightens up a gloomy Columbus day quite like a fluffy, delicious waffle. They’re like pancakes, except they’re obviously much happier. They come in all shapes, sizes, and flavors, and they are guaranteed to put a smile on your face. For a long time, I wasn’t sure if we had any waffles worthy of a Leslie Knope level obsession, but boy was I wrong. Get ready to get your waffle on. About: A Belgian waffle served with butter and warm syrup will only cost you $6.50 at Tommy’s Diner. 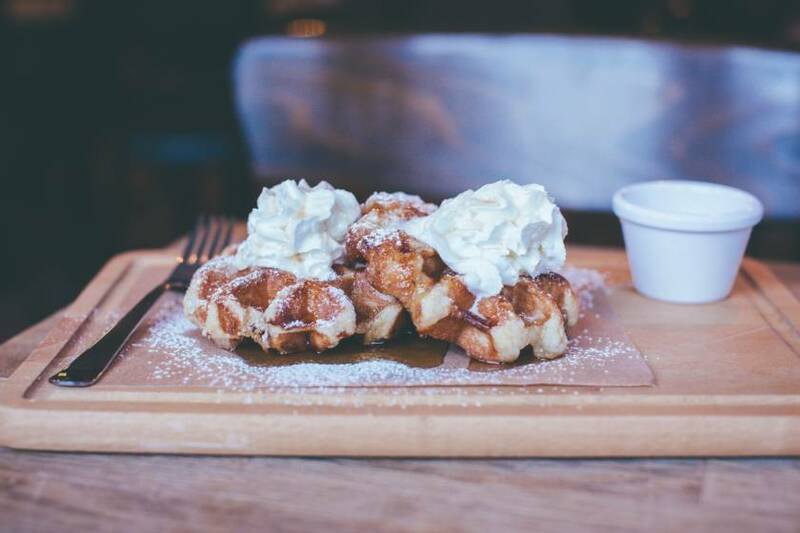 Not only is that pretty cheap when it comes to waffle prices in the city, but they’re also some of the best. Tommy’s frequently has special waffles on offer as well, so don’t be afraid to try something new! About: South of Lane is a charming little neighborhood cafe in Upper Arlington, and in addition to their amazing waffles, they have coffee, tea, sandwiches, breakfast fare, and even retail goods. It’s a one-stop shop kind of place. In addition to good old-fashioned Belgian waffles, they have a Peanut butter & bacon waffle sandwich that is incredible. About: You can only grab The Pearl’s Chicken & Waffles on the weekends during brunch, but that’s probably for the best. If you could eat this meal every day, you just might, and I have to believe that would wreak havoc on your overall health. Their southern style boneless fried chicken sits on a fluffy waffle, drizzled with a warm blueberry sauce and Ohio honey. Is that my stomach growling or yours? About: SuperChef’s SuperWaffles are perfectly named. They are indeed super and once you’ve tasted them, you’ll definitely want to come back for more. They have several different kinds of waffles on the menu, including Cinnamon Toast Crunch waffles which come with actual cinnamon toast crunch flakes on top. I’m so ready for that sugar overload. About: They may spell waffle differently, but who says different is bad? The wafels at Belgian Iron are Liege-style, which means they don’t have those perfectly round or square borders like other waffles. They’re rough around the edges, but totally delicious. Pro tip: do yourself a favor and order the flight of wafels. You’ll want to try more than one, I promise. About: I love love love Taste of Belgium. I was so hyped when they first came here from Cincinnati, and I’m always excited when I stop in at their North Market location. I’m a big fan of trying their seasonal waffles, mostly because it makes me feel like an adventurous eater, even though I’ve never had a bad bite to eat there. It can get a little hectic in the market, but it’s worth the chaos, trust me. About: I know what you’re thinking. “Chelsea, it’s called The Original Pancake House. And I hear you. But they also make a killer waffle! The Belgian strawberry waffle at OPH is like a little slice of heaven. That freshly made vanilla whipped cream on top? Please, and thank you. About: The best part about the Columbus waffle scene is that you can literally get them any time. And that’s largely in part to Forty’s Chicken and Waffles. 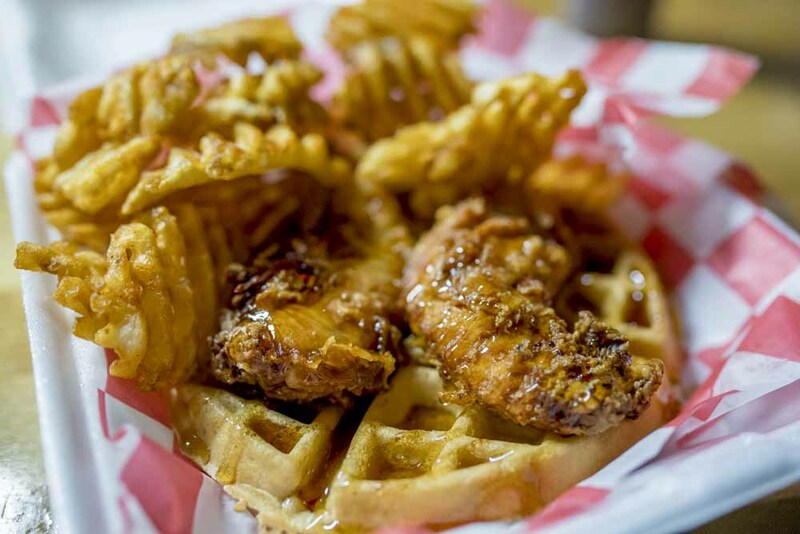 See, they’ve set up shop inside Old North Arcade, which means you can grab a beer, play some video games, and enjoy chicken and waffles all at the same time. Is this a dream? Somebody pinch me!